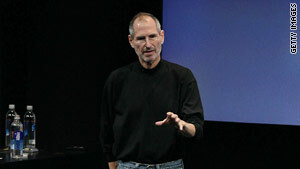 Apple CEO Steve Jobs will be emceeing the company's annual Worldwide Developers Conference keynote on June 7. (Wired) -- Apple has announced that CEO Steve Jobs will be emceeing the company's annual Worldwide Developers Conference keynote on June 7 in San Francisco. Continuing his trend of doing one-to-one e-mail marketing for his $43 billion (revenue) company, Jobs himself helped tout the conference with a personal e-mail to a customer over the weekend. The developer's conference attracts greater than usual attention because, for the past two years, Apple has used the venue to announce the latest version of its iPhone. Gizmodo may have spoiled the surprise this year by leaking what has been confirmed by Apple legal as a prototype of the fourth-generation iPhone. However, in an e-mail exchange with a customer over the weekend, Jobs said the event would still pack a punch. "I hope you have some good WWDC announcements to blow [Google] out of the water," a customer wrote to Jobs on Saturday. "You won't be disappointed," the CEO responded, according to a report published on MacRumors.com. As usual, the keynote address will be held in the Moscone West conference center to kick off the five-day WWDC conference, which includes hands-on sessions for software developers to become familiar with iPhone OS 4 and Mac OS X. In addition to new iPhone hardware, Apple is expected to give further details on its next-generation mobile operating system, iPhone OS 4. The company in March previewed iPhone OS 4, which introduces support for multitasking and the ability to group apps in folders, among other features. Apple's 5,000-seat WWDC 2010 event sold out in eight days. The conference is designed to recruit and educate developers supporting Apple's iPhone OS and Mac OS platforms. The importance of WWDC continues to increase as Apple's rivalry with Google becomes more fierce in the mobile space. Google last week held its sold-out Android developer conference, Google I/O, where executives spent a generous amount of time delivering potshots on Apple's iPhone platform. "If Google didn't act, we face a draconian future. One man, one company, one device would control our future," Vic Gundotra, vice president of engineering of Google, told attendees at the conference. "If you believe in openness and choice, welcome to Android."